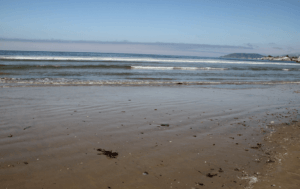 What to know about the tides…. A lot of people ask what the best time of day is to take a surf lesson. Does the tide affect the productivity of the lesson? Well, some instructors may have different opinions or different styles of teaching that play into what they’d tell you but overall the answer is yes. There are a lot of things you should know about the tides starting with the moon. The moon is responsible for all things tide related. Similar to a magnet, the moon is pulling at the earth trying to bring it closer. The earth though has a pretty good grip on everything but water. This is because the water is constantly moving. Each day there are two low tides and two high tides. There is usually about 12 hours or so between the two high tides. As the rotation of the moon, earth, and sun are ongoing, so is the gravitational pull causing the oceans to rise and fall. The earth’s rotation specifically causes the tides to change twice a day. When the moon is new or full the tides tend to be a bit more exaggerated and definitely stronger. Highest and lowest basically. During the moon’s other phases the tides have less of dramatic change. The height of the tide during the day will depend on your location. There are many websites and apps that can tell the tide forecasts. There are also tide watches that have become very popular among surfers. Now back to which tide is most conducive to having a surf lesson. The answer would be a lower tide. Lower tides make it easier for the instructor to have control over the surfer and their board and the waves tend to be easier to maneuver through. Just as a reminder though I am talking strictly about having a surf lesson, mainly for beginners. Feel free to call us in the office to check in on the forecast for the week. We look forward to having you surf with us soon!